Indiana Convention Center has completed an expansion project that has doubled its meeting space while JW Marriott is set to open its largest hotel in Indianapolis tomorrow (4 February). 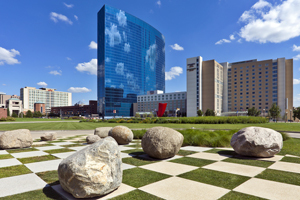 JW Marriott Indianapolis is set to open in Indiana’s capital tomorrow with a total of 1,005 rooms and 44 meeting rooms, each holding between 55 and 4,500 delegates theatre-style. The hotel is opening as the city is gearing up for the centennial of the Indy500, which will take place between 27 and 30 May 2011. JW Marriott Indianapolis is within walking distance of the newly-expanded Indiana Convention Center, which relaunched at the end of January. Located on the site of the former RCA Dome, the Indiana Convention Center features 71 meeting rooms, totalling 10,526sqm, as well as three ballrooms totalling 5,776sqm. The £169m ($275m) expansion project has also added 23,600sqm of exhibition space – giving the centre a total of 52,638sqm of halls. Indiana Convention Center is connected by skywalks to eight hotels, and a shopping and entertainment complex. ADNEC targets North American market as corporate business "regains strength"